Todd Davis writes poems that are spare yet eloquent, poems with an appealing simplicity that belies their insight and consequence. They are rooted in the firmament of nature's frequently bruised bounty, yet grounded by our all-too-human experiences on this planet, living on a land that we so often treat with contempt or blunder through blindly. With the eye of a naturalist and the heart- wisdom of a sage, Davis reveals scenes of our lives that we might have otherwise missed. His poems are like the best kind of snapshot; they show us the details that deserve more attention, from a five-year-old's joy in sitting on Dad’s lap and "driving" the family car or standing on a chair to help Mom make Jell-O, to the devastation of drought on farmland or the extraordinary lushness of an ordinary backyard. Because Davis holds up these prose-photos and urges us to take another look, we suddenly experience their profundity and comprehend their meaning. With disarming directness, he connects nature to family, landscape to community, and earth to faith. 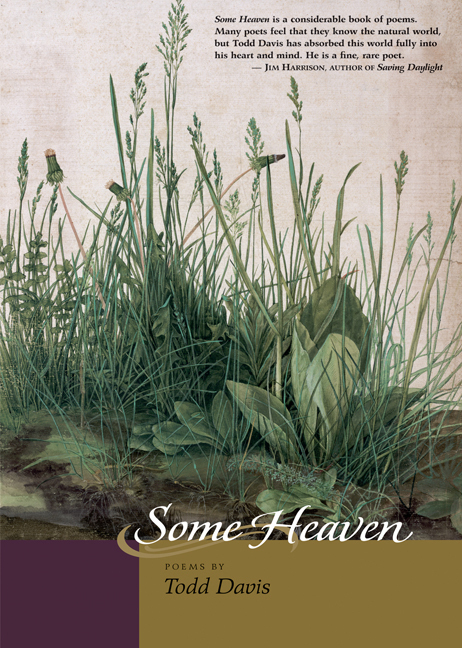 Some Heaven brings together more than 100 Davis poems. Most are concise; all are approachable. In fact, they pull readers in, stirring our senses, tickling our memories. Here are poems about Amish gardens, changing seasons, friends at school, tractors, and deer. Davis urges us to see—not to take a quick look, but to really see—frost on goldenrods, the qualities of dirt, the color of air. Underneath, of course, these are poems about universal themes: love, loss, life, death; but in Davis's skilled hands, they appear to us to be more akin to wild strawberries growing on a rock wall or apples discovered in an abandoned orchard: something fresh, unexpected, and thankfully welcomed.